Nevskaya Palitra. “White Nights”. Extra-fine artists’ watercolours. 12/16/24/36/48 colours in 2.5 ml pans. 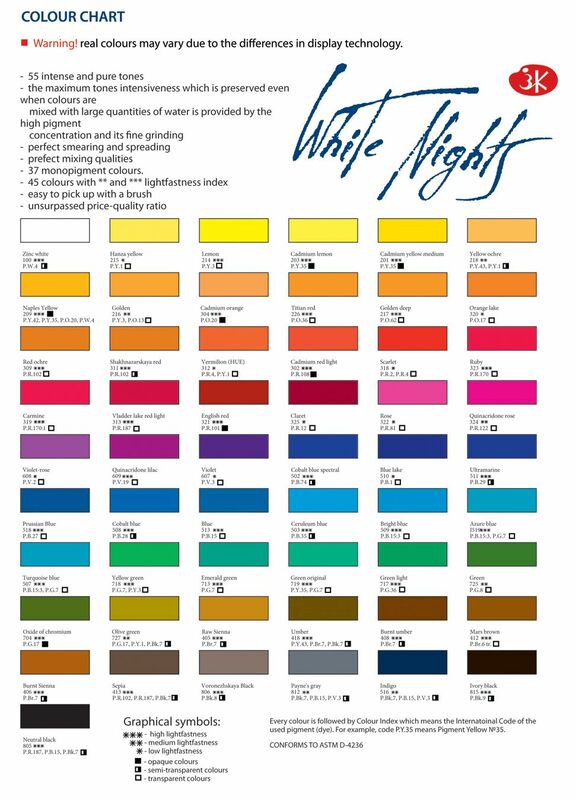 “White Nights” are professional watercolours of the highest quality that combine old masters’ traditions and modern production techniques. The paints are produced of the finely ground pigments and binders adding Gum Arabic which is recognized as the best natural adhesive for professional watercolours. The colours have high intensity colour hues, which do not tone down even when much water is added. This is provided by the high concentration and fine grit of a pigment. The paints have perfect mixing, smearing and spreading qualities. The palette consists mostly of mono pigment and lightfastcolours. Available in sets of 12, 16, 24, 36, 48 colours in 2,5 ml pans, 12 colours in 10 ml tubes and in assortment of 64 colours in 2,5 ml pans. A pocket-sized plastic box with integral mixing palette containing 12 assorted Cotman Water Colour half pans, plus a pocket brush. 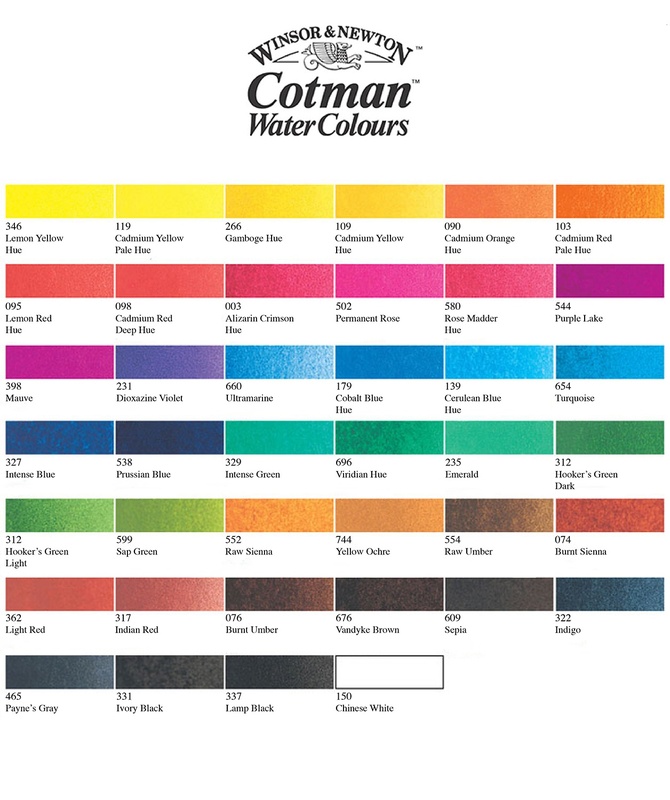 Cotman Watercolours are a range of moderately priced colours which are made to exacting standards and have been carefully selected to offer a wide colour spectrum with a uniform price. The range is suitable for both amateur artists and the accomplished artists who require large volumes of colours at an economical price. They possess good transparency, with excellent tinting strength and good working properties. Costs are kept to an economical level by replacing some of the more costly pigments with less expensive alternatives. This high quality, light weight plastic set contains:1 x Pocket brush 1 x Kneaded eraser 1 x Pencil, 16 x Cotman Water Colour half pans: Cadmium Yellow Hue, Cadmium Yellow, Rouge Cadmium Pale Hue, Cadmium Deep Red, Purple Lake, Cobalt Blue, Ultramarine, Cerulean Blue, Emerald Green, Sap Green, Yellow Ochre, Burnt Sienna, Burnt Umber, Payne's Grey, Chinese White. Actual contents may vary. Winsor & Newton Artisan Water Mixable Oil Colour has been specifically developed to appear and work just like conventional oil colour. The key difference between Artisan and conventional oils is its ability to thin and clean up with water. Hazardous solvents are not necessary for Artisan and artists can enjoy a safer painting environment, making it ideal for artists who share a work space, schools or painting at home. The Artisan range consists of 40 colours and has a dedicated range of Artisan solvents, oils, and mediums, allowing you to achieve all oil painting techniques. To create a masterpiece, one has to have a creative mind, a great amount of skill and also an art set which is of good quality. 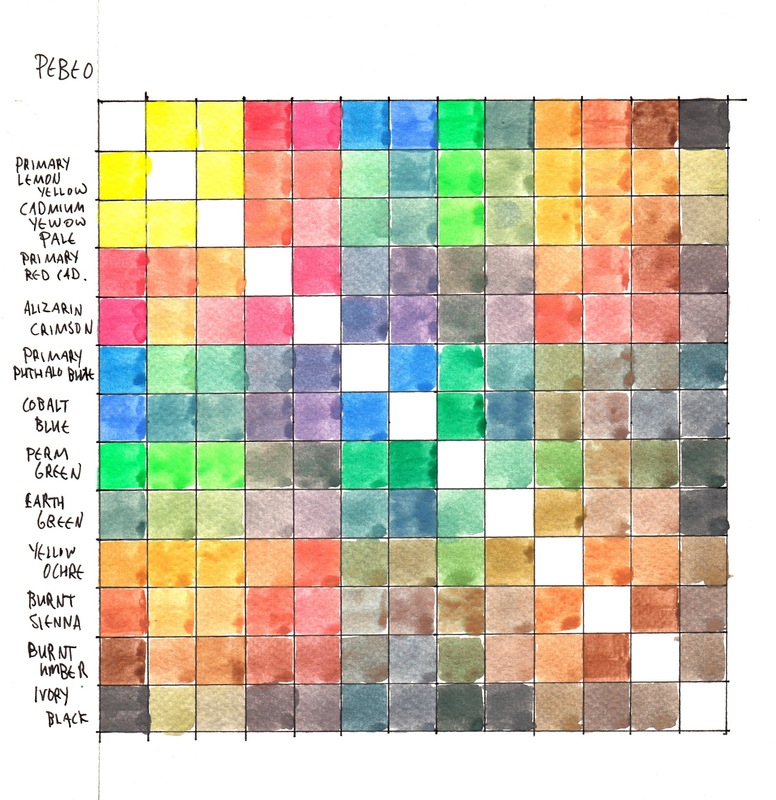 Pebeo brings to you this Fragonard Extrafine Watercolors to ensure that the quality of your work remains impeccable. This set consists of 12 watercolors set pans which will enable you to add more color to your work. This art set comes from the Fragonard Extrafine series and is ideally meant for artists use. These rich and intense watercolors are blendable, thus giving you the privilege of mixing colors to attain a new shade. In addition, these watercolors are enriched with honey for excellent adhesion. These transparent and light resistant watercolors by Pebeo will definitely be a valuable add on to your shopping cart.